The latest film by Wim Wenders, Submergence, will open the 65th edition of the San Sebastian Festival on September 22. This will be the European premiere of the co-production between Germany, France, Spain and the USA, after its screening in Toronto. The cast of the film, which will compete for the Golden Shell, is headed by James McAvoy and Alicia Vikander. The story, shot in Berlin, Madrid, Toledo, different locations in France and Djibouti, was penned by Erin Dignam (The Yellow Handkerchief, The Last Face) based on the famous novel of the same name by The Economist correspondent J.M. Ledgard (Giraffe). 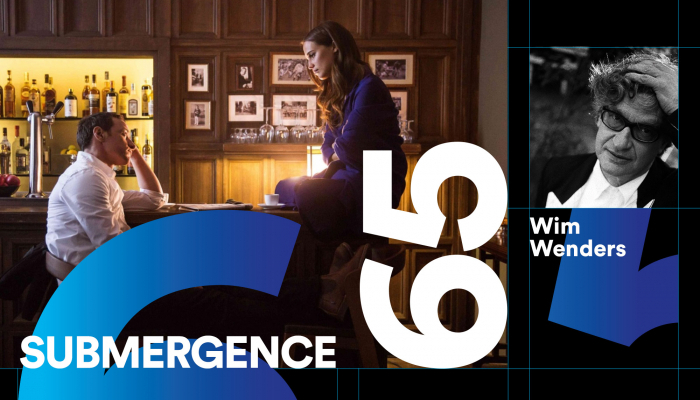 James McAvoy and Alicia Vikander embody a hydraulic engineer and a bio-mathematician who meet in a hotel on the French coast, where both are preparing their missions. While she works on a project of immersion in the Greenland Sea, he is taken hostage in Somalia. The German filmmaker, screenwriter and producer Wim Wenders (Düsseldorf, 1945) has worked during his career in both Europe and the United States, putting his name to some of the most relevant films in the last four decades, including Der Stand der Dinge (The State of Things, 1982), Golden Lion at Venice Festival; Paris, Texas (1984), screened at the San Sebastian Festival after receiving the Palme d’Or at the Cannes Festival; Der Himmel über Berlin (Wings of Desire, 1987), winner of Best Director in Cannes; and the documentaries Buena Vista Social Club (1999), which garnered over a dozen awards at the Seattle, New York and Los Angeles festivals; Pina (2011), premiered at Berlin and presented in the Zabaltegi Pearls section in San Sebastian, or Salt of the Earth, co-helmed with Juliano Ribeiro Salgado (1914), Un Certain Regard Special Prize and Audience Award in San Sebastian. Founder member of the European Film Academy, in 2002 he chaired the San Sebastian Festival Jury, which awarded the Golden Shell to Los lunes al sol (Mondays in the Sun) by Fernando León de Aranoa. Scottish actor James McAvoy (Glasgow, 1979) plays the leading part in The Last King of Scotland (Kevin Macdonald, 2006), Atonement (Joe Wright, 2007), The Disappearance of Eleanor Rigby (Ned Benson, 2014, selected for the Festival’s Pearls section) and Split (M. Night Shyamalan, 2016), in addition to embodying a young Charles Xavier in three films of the X-Men saga. Swedish actor Alicia Vikander (Gothenburg, 1988), remarkable for her performances of Kitty in Anna Karenina (Joe Wright, 2012), Queen Mathilde in En Kongelig Affære / A Royal Affair (Nikolaj Arcel, 2012) and Ex machina (Alex Garland, 2014), won the 2015 Academy Award as Best Supporting Actress for her part in The Danish Girl (Gerda Wegener) and will see her performance as Lara Croft take to the screen next year in the latest instalment of Tomb Raider (Roar Uthaug, 2018). The soundtrack is written by Fernando Velázquez (A Monster Calls, The Impossible), once again featuring the Basque National Symphony Orchestra. Wenders himself came to San Sebastian in March to attend the recording. Submergence is a German, French and Spanish production. An Atresmedia Cine’s presentation produced by Lila 9th (USA) in coproduction with Neue Road Movies, BacKup Media Studios, Morena Films, Submergence A.I.E and UMedia, with the collaboration of Atresmedia and Movistar+’s participation. It will be internationally distributed by Embankment Films and in Spain by Entertainment One Films Spain (eOne Films Spain).